A delegation to the Ministry of Defence of Tony Banks MP, Jeremy Corbyn MP, Tom Cox MP, and myself as BUAV’s Campaigns Officer handing in a letter to Michael Heseltine, the Minister of Defence, asking a large number of specific questions relating to experiments conducted at Porton Down, the U.K. government’s military research laboratory near Salisbury, Wiltshire. 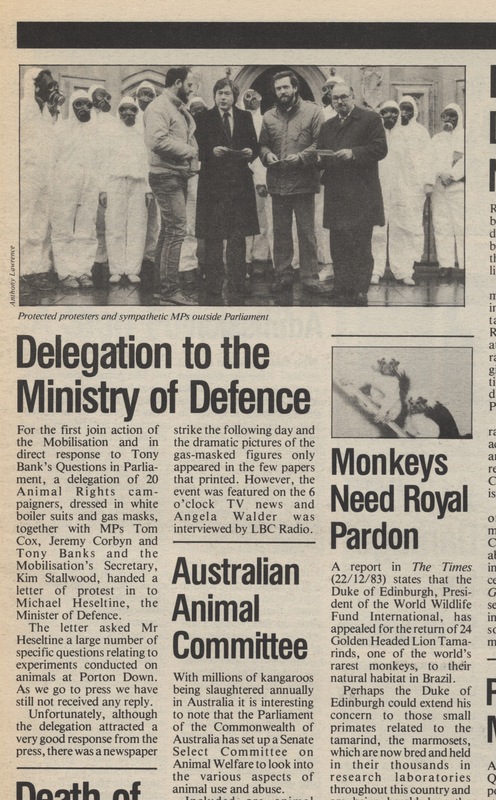 Scanned from The Liberator, which I co-edited and was published by the British Union for the Abolition of Vivisection (April/May 1984, 5). Jeremy Corbyn MP, now leader of the Labour Party, consistently shows personal interest in animal rights as a vegetarian and in Parliament with political opposition to violence to animals since his election in 1983.